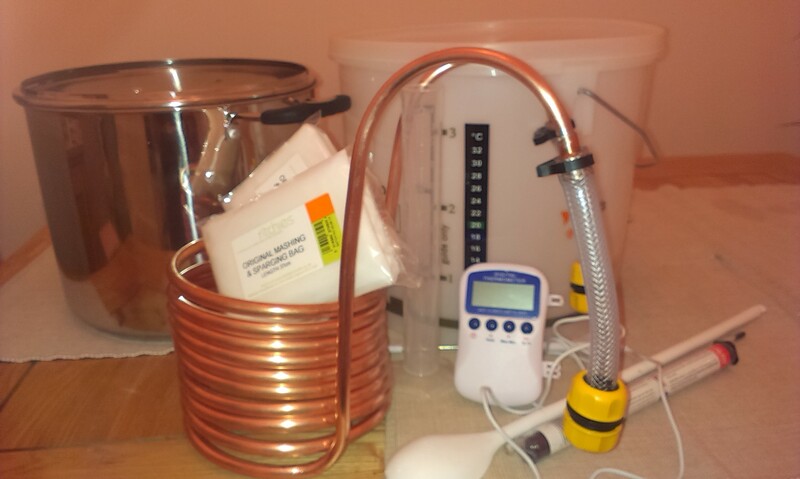 Our first attempt to use the new Brew in a Bag kit was on Friday evening. It had been quite some time in the planning but, thanks to this video from Massive Brewery and Broadford Brewer’s blogs on BIAB, we were ready to give it a go. That was until we weighed out the grain and realised that Kev had forgotten to buy any crystal malt. A great start! Thinking on our feet / making it up as we went along, we just upped both the black malt and flaked barley to 150g each and hoped for the best. While it involved a lot of guesswork on quantities, the process itself was reasonably straightforward. For the mash, two mashing & sparging bags full of grain were submerged in 5.5l of water (72C). The contents of both bags were stirred thoroughly to remove any dry spots or clumpy bits and the mash was underway. Worried about losing heat across a 60 minute mash, we were aiming for the high end of a mash temperature and got it with a reading of 67C. The picture below shows both the glorious moment of having got the intended temperature and the makeshift attempt at insulating the pan. Thanks to the blanket not working all that well, though, it didn’t stay at 67 degrees for long. After much putting back on the heat, taking it back off the heat again, shoving it next to radiators, etc. the mash finished after an hour at a temperature of just over 62C. Having squeezed the contents of both bags back into the pan (potato masher and colander technique) and cranked the heat up on that in preparation for the boil, it was time to sparge. 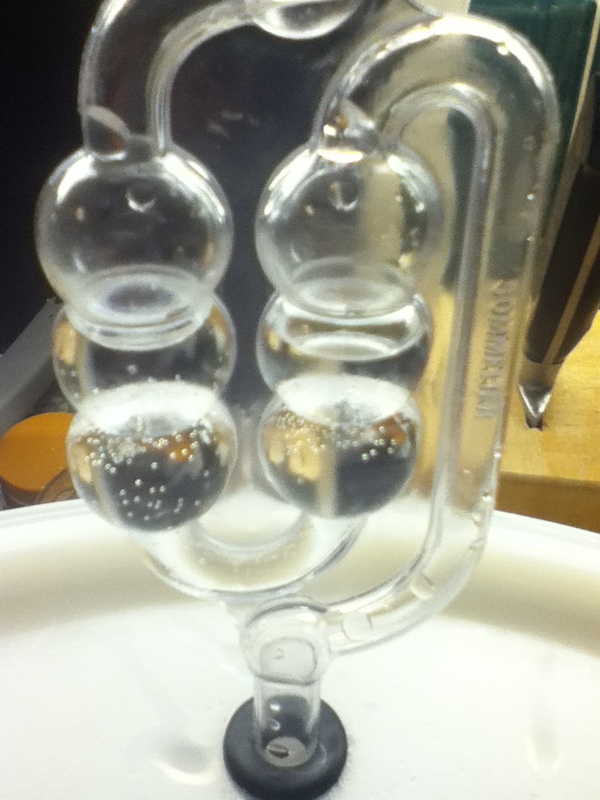 Both bags were submerged in the fermenting bin under 8l of water (81C) for 10 minutes. Some serious further squeezing ensued and, with hands gently blistering from the heat, we poured the fermentor’s contents into the pan and ended up with about 11l of wort to work with. A 60 minute boil was then started. Even though the first runnings had been on the heat for 15 minutes before adding wort from the fermentor, it took a long time to get a rolling boil going. Once there, the first lot of hops were added. After another 40 minutes, the second lot of hops went in, followed after 5 more minutes by some protofloc finings and the very slow immersion of the wort chiller. 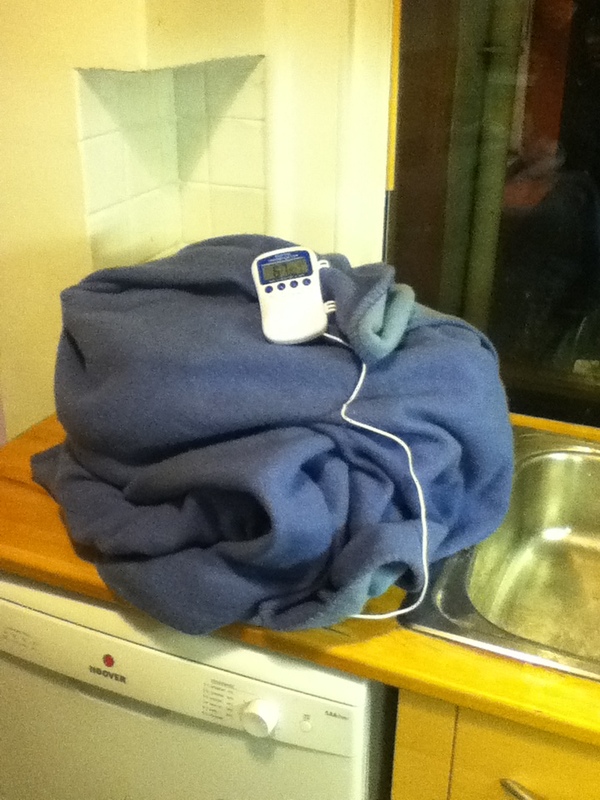 Thanks to the chiller, and a cold Scottish evening, it only took about 15 minutes to get the wort down to 20C post-boil. At this point the end was nigh. The wort was transferred from the pot into the (now) sterilised fermentor, using the hop bags inside a sieve as a filter. The wort was areated, Mangrove Jacks British Ale yeast was pitched and the whole lot was sealed up at about midnight. Thankfully lots of bubbles in the airlock by 7 o’clock the next morning so, whatever happens, it should be beer in there. 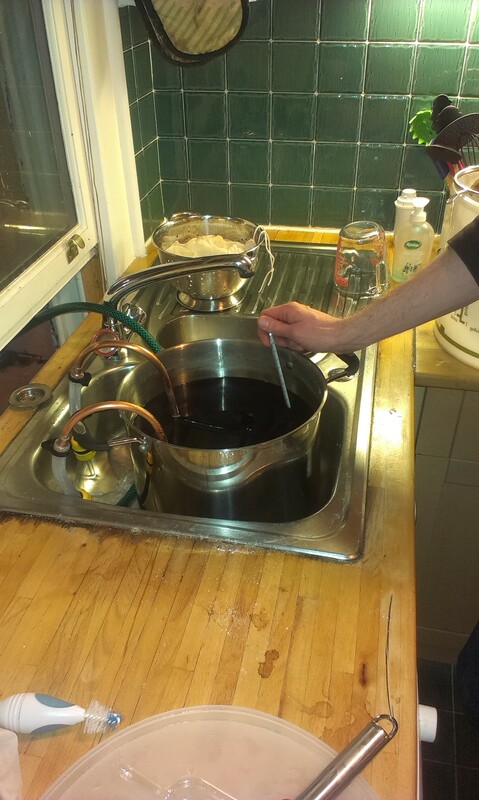 We ended up with 9 litres of liquid with an OG of 1046, so we have less than the 10 litres we were aiming for, but should get a stronger beer as a result. We can live with that. There were lots of positives from the whole experience of brewing in a bag for the first time. The process itself was a lot of fun and the small scale of the equipment meant that there was never a lot of heavy or nasty work to do. In fact, we were able to spend quite a bit of time drinking beer and talking, so all pretty pleasant really. Perhaps most importantly, it took us less than 4 hours from weighing out the grain to sealing the fermentor at the end, which (just about) makes it do-able in the evening after the kids have gone to bed. Very good to know. Definitely some areas to work on, though. Other than buying the right grain next time, the big issue seems to be how to retain heat. We will need to work on a way to better insulate the pot for mashing. If whatever that solution ends up being would help the wort come up to the boil more quickly too, then that would be great. Next brew coming soon hopefully. 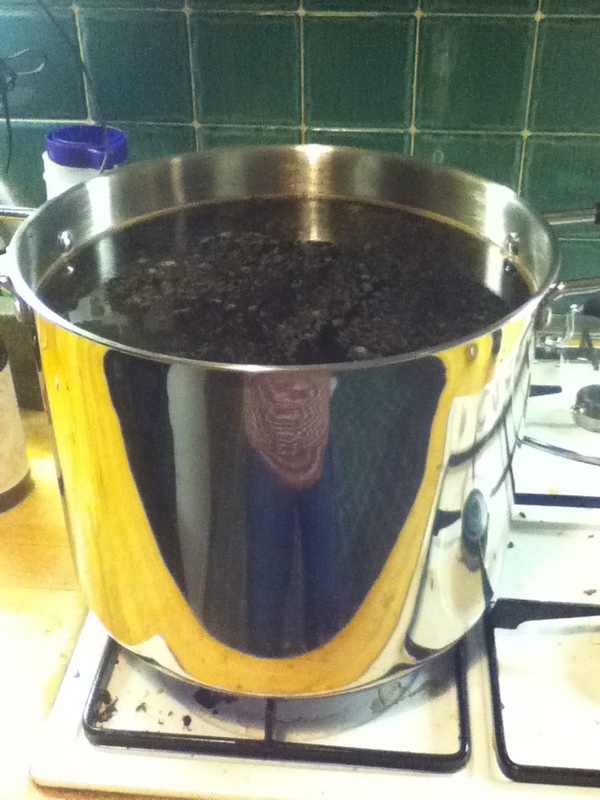 This entry was posted in Uncategorized and tagged BIAB, homebrew, stout on January 27, 2014 by bagboilbeer.